In response to demand, the author has written a new chapter on the subject of least squares estimation. To support this new topic, an appendix has been added, presenting additional matrix algebra. This second and enlarged edition of this established textbook for students and professionals is again problem-oriented, and is generously illustrated with worked examples and exercises. 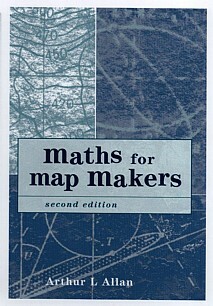 The book will assist anyone with the mathematics involved in map making. It starts from an elementary standpoint and progresses to give the student a sufficient level of understanding to cope with most topics encountered by the map maker, including those of elementary surveying. The material is in two carefully cross-referenced parts. Mathematical topics and concepts are presented in the first part, enabling the relevance of each topic to be made clear. The second part contains a glossary and formulae summaries with several appendices. Numbers and calculation; Plane Geometry; Trigonometry; Plane coordinates; Problems in three dimensions; Areas and volumes; Matrices; Vectors; Calculus; Conic sections; Spherical trigonometry; Solution of equations; Least squares estimation; Appendices. Students of geomatics including surveying, cartography and photogrammetry, geography and civil engineering. Ideal for anyone, whether in industry or academia, who requires a reference work on the mathematics involved in map making.